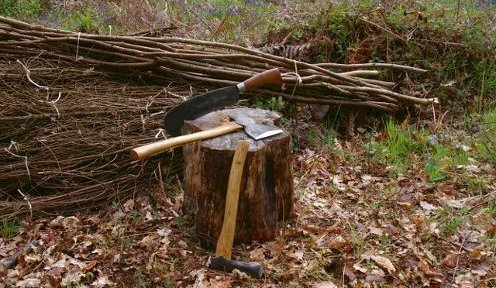 theluddite: hand tools, repairs, sharpening. I supply good quality hand tools, carry out tool repairs and sharpening. I also deliver the occasional short course on tool maintenance and sharpening. I have a modest workshop and I'm one of the few people who will still re-handle garden, forestry and workshop tools. For a glance at what I do have a look at my portfolio gallery (opens in a new window). If you think that you might need my services please get in touch by email. Each year I attend a number of shows and events in the Southern England, selling my tools. This is the best way to buy tools from me, as I can give you advice, and you can get the "feel" of items. I may be interested in purchasing your old tools (gardening, forestry, carpentry, joinery, blacksmithing, fencing, agricultural etc.) - please get in touch, tell me what you have, and do feel free to include photos of interesting items. Tradesman's sets of tools, locally made items and unusual tools all particularly intrigue me. As you might expect I don't just buy to sell - I keep rather a lot of tools to use. If you need your tools re-handled or repaired, I'm one of the few people who will do this, and I get enquiries from all over the UK. I'm very happy to discuss your needs and options. My tool reconditioning activities were featured in an article in Reclaim Magazine - reproduced with their kind permission. I think it is true to say that I have some Luddite tendencies. No, I don't wreck machines (well, not often, and usually not intentionally, although I do hate computer printers with a passion, and have defenestrated one) but I do feel that older methods, materials and technologies are often needlessly thrown aside. Built in obsolescence and poor quality in manufacturing make me grumpy - I have christened poorly manufactured items of this kind "Instant Landfill" : buy it, break it, chuck it - repeat frequently. No user serviceable parts. Who is actually benefiting from this? Tools and machines should be durable, repairable, and a pleasure to use. Contact me by email. I'll try and respond promptly, but the majority of my work doesn't involve sitting at a computer, so please give me a day or so.